In class, we individually read “A Healthy Retirement?”, which was a case study we went over. After we read the story, we filled out a chart of the healthy and not so healthy things a couple were doing. Jim and Nancy are a couple who are in their sixties, but are both suffering from some medical problems, serious and not as serious. The couple are preparing for a party at their house before they leave for a cruise, and Nancy states that she has serious back pain and feels excessivelly tired. She is a strong believer in pain killers and uses those to feel back to normal. As the couple go on their cruise, they eat a ton, just as anybody else would do on an extravegant vacation. They take many strolls, which helps balance the amount of food consumed. Nancy complains of tiredness and has problems breathing as they are off the ship, and end up getting back on the ship to seek a doctor to help with her health problems. It was concluded that Nancy most likely has Angina, which is chronic chest pain caused from not enough blood flow to the heart muscle. Here is a graph of the data I found in the information they gave us! We got together as a class to grow info! Besides the information given to us, other facts that would be helpful to know when assessing their health would be their everyday diet, every type of prescription they may be taking, past family history diseases, and all medical records from their entire life. 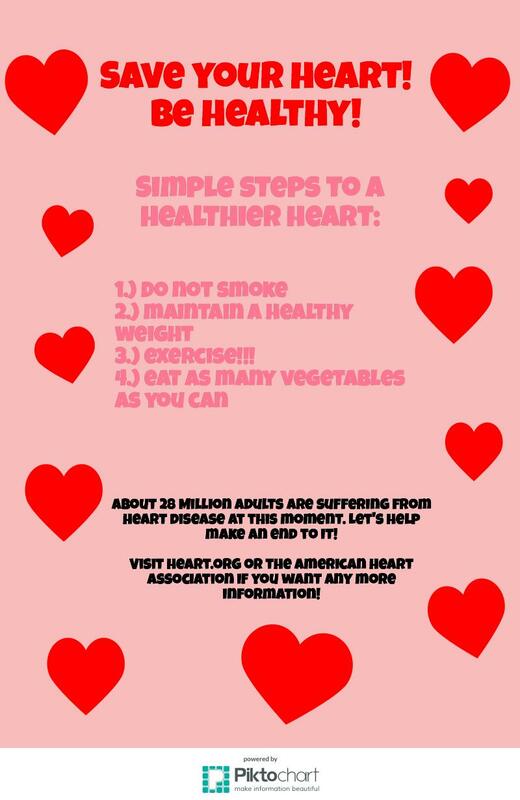 Here’s a little banner I made on Heart Disease. I thought it was a great opportunity to spread awareness of this disease with you guys since Jim and Nancy are both at risk for this! You post thoroughly reviews the case study and presents all the relevant info well. The data table and original media you included add a lot to your post (although I would make them a bit larger). Make sure to answer all conclusion questions and support your answers with data (hyperlink resources as well). Were you surprised to find out that women and men have very different symptoms? Looking forward to future posts!